Welcome at our budget friendly hotel situated at Amsterdam Airport equipped for the convenient traveler. We have 24-hour reception, early breakfast, free WIFI and free shuttle-service to Schiphol Airport. Drop your bags and relax at our ibis budget hotel. Our hotel is located near Schiphol Airport and is easily reached with the free Airport Shuttle Service. Just across the hotel is a bus station Schiphol Noord from which you can take the bus to the city centre of Amsterdam (only 20 minutes). Get your day off to a bright start with a delicious breakfast, served from 4am for early fliers. You could also go shopping at the Schiphol Plaza or go plane spotting from your room. Travel to Amsterdam's city centre within 20 minutes by bus. Schiphol Noord bus station is just across the hotel. Make sure to visit the highlights of the city, such as the Rijksmuseum, Anne Frank House or Stedelijk Museum. Nearby to the hotel is the Amsterdamse bos (Amsterdam Forest) where you could enjoy the nature or go for a run. You can also visit the Red Light District or make a boat trip on the Amsterdam's canals. In spring we recommend you to visit the Keukenhof. 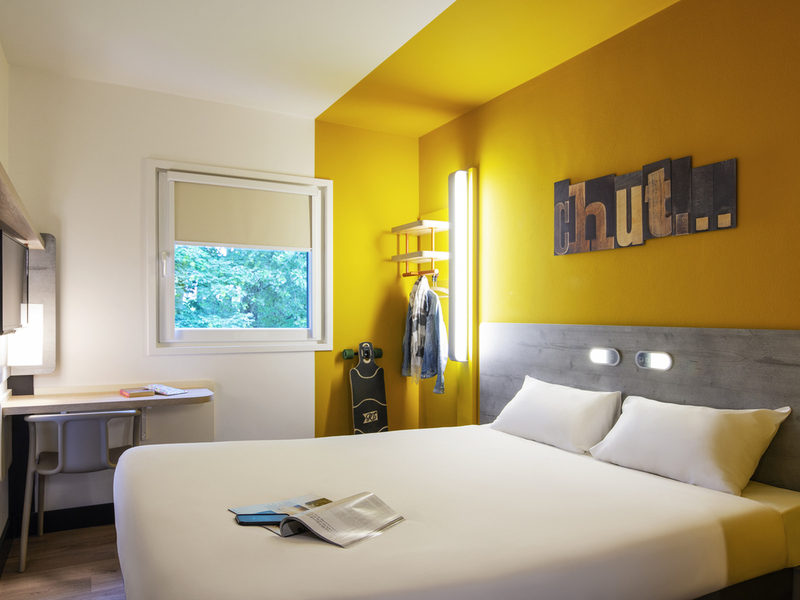 The modern and fuctional rooms at ibis budget Amsterdam Airport can host up to 3 people in one room - thanks to the extra single bunk bed. Our rooms have comfortable beds, a flat-screen TV, shower, seperate toilet and free WiFi. It was a nice experience to stay close to airport and free shuttle was cherry on cake. Staff was very nice and location was decent. Even being closer to airport the room was sound proof . Just not satisfied with the options provided in breakfast. It was not bad by any means , but I would love to see more varieties. Also a kettle and tea coffee should be provided in room , which i was missing a lot. For the price the room is poor. Shower smelled like urine. The staff is friendly, the room clean. I had a good stay, but as I had a front room (number 34) there was quite a bit of noise of bus passengers getting out. There is room for improvement in my opinion: a hair dryer should be present and the light for reading in bed is way too low. I was a bit unfortunate: the television had a problem (no signal), but the night receptionist was very kind and offered me another room or a free breakfast. Good service for check in at reception- Room clean and comfortable with basic things. Breakfast great! Clean, staff were helpful, breakfast was very good for a continental breakfast, beds were comfortable, noise levels were low. Friendly staff. Excellent breakfast. Shuttle bus provided from and to the airport free of charge. Good as usual staff friendly, room clean with standard bed. Very nice and friendly staffs. Good to stay and move to the airport. This is an excellent budget hotel, with kind and helpful staff, clean rooms, and comfortable beds, conveniently located as to airport and public transportation. We enjoyed our stay. We were stranded in Amsterdam for two days beyond our plans, and the hotel staff worked to accommodate our unexpected needs. Just right. All the basics covered. I stayed for a couple of nights. It is my second stay at Ibis Budget Schiphol. I knew what I would get for the - very reasonable - price I paid. A comfortable bed, basic and clean toilet and bathroom facilities, just about enough space, and a convenient location with reliable shuttle service to the airport. No luxuries, but nothing to complain either. You get just what you need for a night stay. Efficient and friendly front desk had made our cozy stay and moving around in Amsterdam very pleasurable. The presence of a proper snackbar or cafeteria would have been great. The burger bar of IBIS Hotel, nearby, was overloaded and hence gave indifferent service. Budget hotel easily accessible with good amenities. I've have been using your facilities thru Booking, but this year I found the price way to high; so I got registered and became a member. Cheap price with ibis/ACCOR DOESN'T MEAN quality and service downgrade or sacrifice! I was your customer before, I am your customer and I will be your customer. I am happy and satisfied with the overall result and that is what counts.